It's a simple but effective idea. Fit one of these stickers to your kayak, and in an emergency, the rescue helicopter can simply land on your deck, just alongside the day hatch. There will be no need to mess about with winching or all the tricky stuff we show how to do in our new DVD, Volume 3, Sea Kayak with Gordon Brown. Apparently the deck markings conform to Civil Aviation CAP437 albeit slightly smaller than they should be. Who would dream up such a brilliant idea? 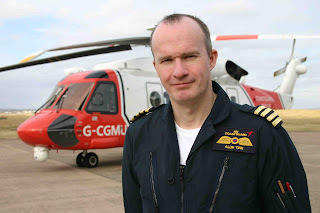 Non other than Stornoway based pilot of Rescue 100 Coastguard helicopter Captain Alun Tink. This is the man in himself. And yes, he's a sea paddler. In the main film, Alun goes through the safety kit he takes sea kayaking and it's one of the most riveting sections. When you watch it, I guarantee you'll be taking mental notes. Alun tells me he had these deck stickers made (for a laugh if you're still taking this serously) by Art & Sea in Oban who specialise in graphics for kayaks and have some more practical offerings too. It was Alun who kept us safe while filming 'Handling Emergency Situations' earlier this year and who features in the clips I posted earlier this week. 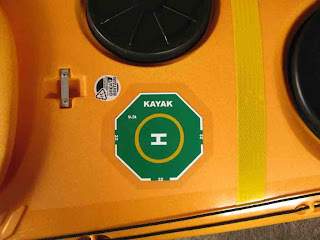 And it was Alun's team of rescue professionals who, working with Gordon, devised the rescue protocol for winching kayakers from a raft of kayaks. 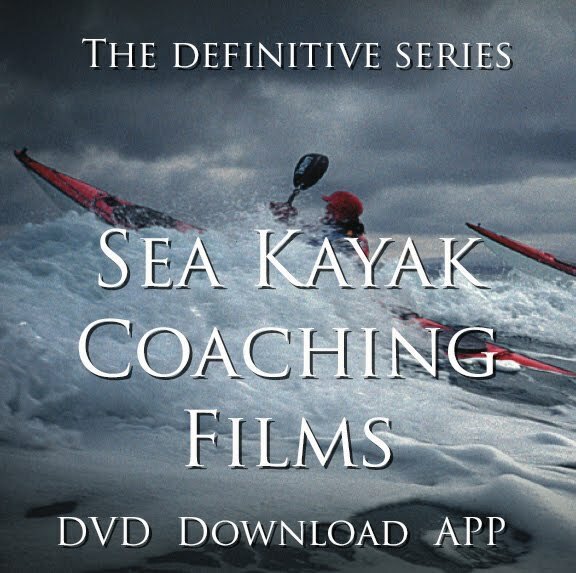 You'll see all of this in the main trailer for the DVD which goes live here next Thursday morning with a longer Video Podcast at SeaKayakPodcasts.com. If I get them finished they might even go live slightly early.